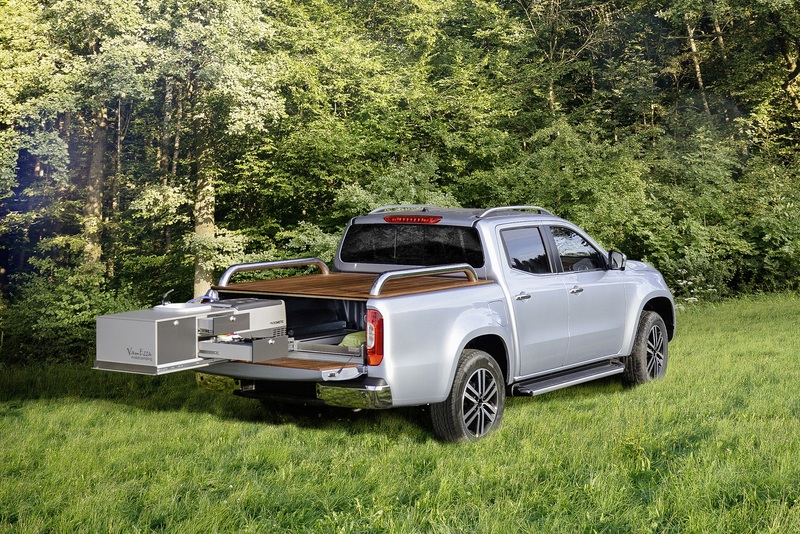 Mercedes is jumping knee deep in the backwoods with its new X-Class pickup truck line. Previously, the German automaker announced partnerships with extreme sports leagues to promote the truck. 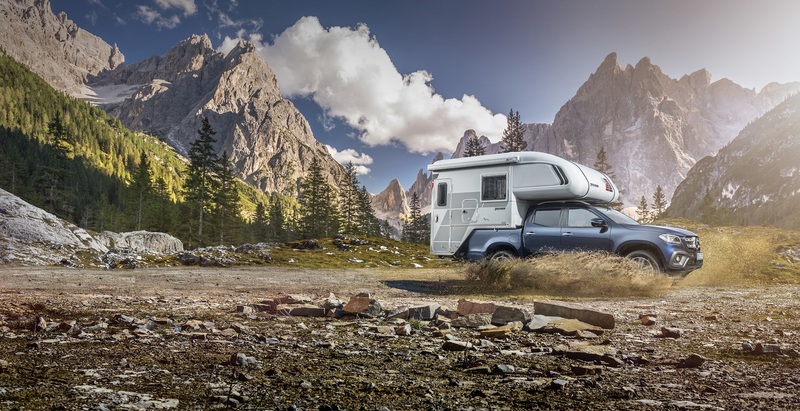 Now, the crew is going to unveil some camper concepts at the upcoming Caravan, Motor, Touristik (CMT) 2018 show. Bodybuilder Tischer plans to show off a demountable cabin which offers a comfortable alcove for sleeping, 6 ½ feet of headroom, a kitchen with a 3-burner gas stove and three comfortable seats. The seats can also be converted into a second bed. The camper also includes a fold-away washbasin, a swiveling toilet, and has enough space to take a shower. VanEssa mobile camping is showing off a heavy-duty pullout module weighing 550 pounds which comes with a fully equipped kitchen. A second pullout module offers up even more space for supplies and other items. VanEssa protects the compartments with a cover made of teak like you’d see on a yacht. Pneumatic struts let you prop up the covers at a 45-degree angle. Also on display alongside the X-Class will be the complete Marco Polo travel van family. 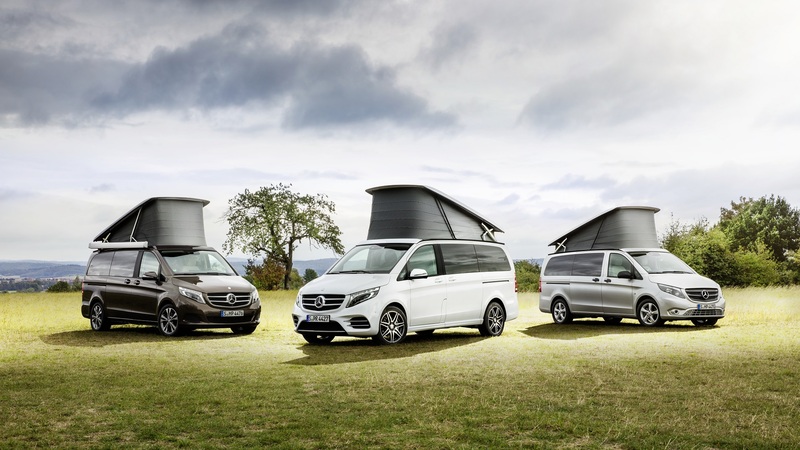 Three versions of the compact travel van will be on display including the Marco Polo Edition in mountain crystal white metallic, the Marco Polo Horizon Edition in brilliant silver metallic, and the Marco Polo Activity Edition in flint grey metallic. This is the first year the Marco Polo will be available in a right-hand drive model. I must admit, when thinking about Mercedes, I don’t exactly picture RV World. With a broad lineup of new vans and trucks now available perhaps Mercedes can make a big splash in this segment. Mercedes hopes the partnership with UCI can help launch the X-CLass. Mercedes sees room in the luxury SUV market for a mid-size pickup. But does this sales boom indicate a bust is coming?